If there is one word that perfectly describes the sights, the scents, and the tastes of autumn, that word is pumpkin—bright orange pumpkins carved and lit for Halloween, glowing pumpkin spice scented candles, and warm homemade pumpkin pie ready for dessert. We’re doing our part to carry on this autumn tradition at Branson’s Chocolates, where we’ve created Pumpkin Spice Bars in creamy White Chocolate and Pumpkin Spice Truffles in sweet Milk Chocolate just in time for pumpkin season. Pumpkin Spice flavor isn’t just a new trend. “’History shows that pumpkin spice-like combinations have been used for millennia in various cultures,” said Kantha Shelke, a scientist at Corvus Blue, a Chicago-based food science and research firm and an adjunct professor of regulatory science and food safety at Johns Hopkins University. “For instance, similar mixtures of spices are used in Indian masala chai and Middle Eastern baklava.” Shelke notes that “spices are powerhouses of phytochemicals — chemicals that the plant makes to protect itself — that can afford us health and protection from many health issues.” Here’s to Pumpkin Spice, and everything nice! Branson’s Chocolates, your pumpkin spice headquarters, is right here in Ashland at 1662 Siskiyou Boulevard. We’re just a block south of 7-11, in the Minute Market shopping center. We won’t be out and about in October, so come see us in the store and get your pumpkin spice fix. We’re open Monday-Friday 10-6, and Saturday 11-5. 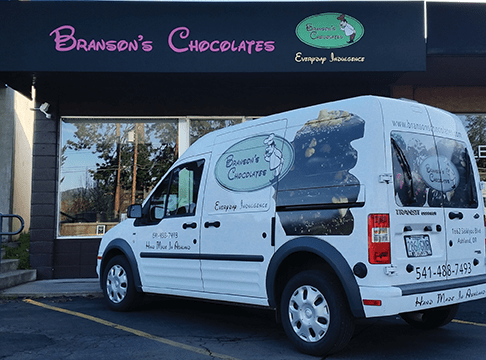 Branson's Chocolates is the only locally owned locally producing chocolate company in Ashalnd. We hand craft in small batches our Truffles, Toffees, Caramels and much more. We team up with local wineries, distillers, growers and roasters for ingredients and custom labeled items. Come see us at work and take some confections/chocolate with you.